Available for a 12-month subscription. Audio files: The numbered audio files correspond to the numbered sections of the lessons in the manual that have an audio file for you to listen to. Listening to the audio files will help you master the fundamentals of Russian pronunciation. As you listen, you'll hear a male and female pronounce each sound. The two native speakers may, at times, seem to pronounce the sounds differently. Be assured that in such instances where the pronunciations seem to differ, in fact both pronunciations are within the range of normative Russian pronunciation. Video files: The video files correspond only to the even-numbered lessons of the book. They depict the writing of the cursive letters of the Russian alphabet in various combinations (each letter in word-initial, mid-word, and word-final position with a variety of other letters before and after it). There are video files for most, but not all, of the writing samples in this manual. 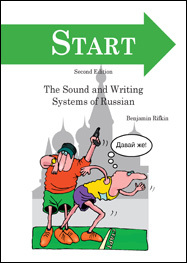 Please note that the purchase of the online audio and video files for START does not include a digital version of the book. The textbook is available for purchase separately at www.hackettpublishing.com. If you are an individual who would like to enroll in the course, please register here. If you would like to purchase a copy of the book, "START, 2nd Edition," please click here.